We came out of the Lama Temple and had a better look at the road the entrance was in. There we saw a tablet explaining that this was the Beijing Imperial Academy road and we saw the Temple of Confucius so we decided to go into it. Located on Guozijian Street inside Anding Gate, the Temple of Confucius is the place where people paid homage to Confucius during the Yuan Dynasty (1271-1368), Ming Dynasty (1368-1644) and Qing Dynasty (1644-1911). The Temple of Confucius was initially built in 1302 and additions were made during the Ming and Qing dynasties. It has a total area of 22,000 square meters. 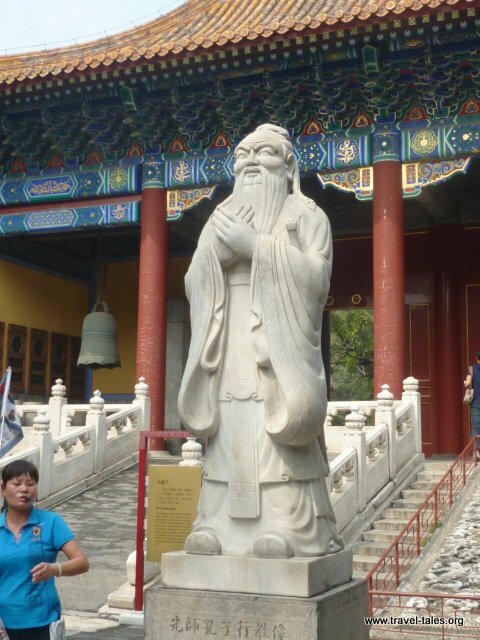 It is the second largest temple constructed for Confucius, the greatest thinker and educationalist in ancient China, ranking only behind the Temple of Confucius in Qufu, Shandong Province. In the temple, you can also find remarkable pictures like two flying dragons playing with a pearl among clouds, which are believed to be used only in the imperial palaces because dragon stands for emperor in ancient China. From those, it is easy to imagine the importance of the Confucius Temple in the feudal society of China. This temple consists of four courtyards. 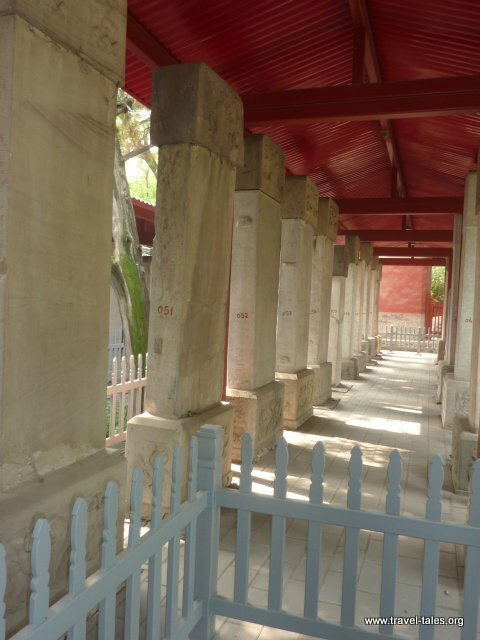 Dacheng Hall is the main building in the temple, where the memorial ceremony for Confucius was often held. Inside the temple 198 stone tablets are positioned on either side of the front courtyard, containing 51,624 names of Jinshi (the advanced scholars) of the Yuan, Ming and Qing dynasties. Another item of interest is the 700-year-old Chujian Bai (Touch Evil Cypress tree) in the temple. Its name is associated with an ancient legend. During the Ming Dynasty, one day the superior official – Yan Song came to worship Confucius on behalf of the emperor. When he was passing by the cypress, one of the branches of the tree took his hat off. Since Yan Song was a treacherous official, people have thought the old tree could distinguish between good and evil people.